Now the digital format didn’t just bring overwhelming choice for marketing your business, it also enabled companies to slip into your selling space virtually overnight. This has had a serious impact on local businesses, crushing their sales and forcing them into bankruptcy. Let’s face it, everyone has a mobile phone or a computer and they aren’t afraid to use it. Local marketing could save your business though. Ready to start local marketing? Local marketing, it really applies to big and small businesses even those that trade across multiple parts of the country. When people think of the word local they think of the little shop that sells newspapers and lottery tickets. But when you start to break everything down into a local perspective, it is only then you can truly understand the demographics of your business and how it performs. Basically, everything that you think in regards to marketing, can be on a local level. Think about every campaign you ever plan from this perspective and you can drive the most revenue from each marketing activity. Most of the advertising platforms that are around can target users in a particular area. Whether this is Facebook or Adwords. Chances are, whatever you use to promote your business at current has the functionality sitting behind it ready to harness a little location targeting. If you aren’t already testing Geo fencing in your advertising campaigns it can be a great way to almost instantly cut the costs associated with your campaign. For those with mobile apps, you can of course also use push notifications. Utilising geographical targeting allows you to dial in on a very specific area which of course means you can cut costs from avoiding consumers who won’t be interested in your product. The advantage of looking at things from a local perspective is people interact differently with products even when you throw location into the mix. I like to think about it as an extra piece of information that is attached with the customer. Someone who is already in a city center for example, will be more likely to walk into your shop than someone ten miles away, depending on the product of course! All of this also means that your budget isn’t stretched among a plethora of locations, just the ones that matter to your business and it means that you can save a tonne of money whilst boosting conversions. It’s worth noting that depending on your business the way you might advertise will change. Adwords is one of the more sought after platforms for advertising on a local perspective. I highly recommend using sitelinks in tandem with a punchy call to action that provokes an action. The ad should be heavily tailored towards the moment and search intent. For example, someone searching for plumbing supplies on their mobile during the day is most likely going to be a tradesman on a job looking for a specific part in a hurry. Running your advertising locally to them alongside timing it correctly can give you the visibility but ensuring you close the deal is another matter entirely. With the above in mind, imagine the type of call to action that will invoke a sale. “Plumbing parts for sale” gives the sense that you can buy what you need, but there is no sense of urgency. “Need a plumbing part in a hurry?” would be a better call to action from a local perspective, with the description reading “Order online and collect in store if the product is in stock”. The semantics of search are ever changing and this can be very easily seen in the way that Google displays data depending on your search results. Everything is intent in the modern world of marketing. 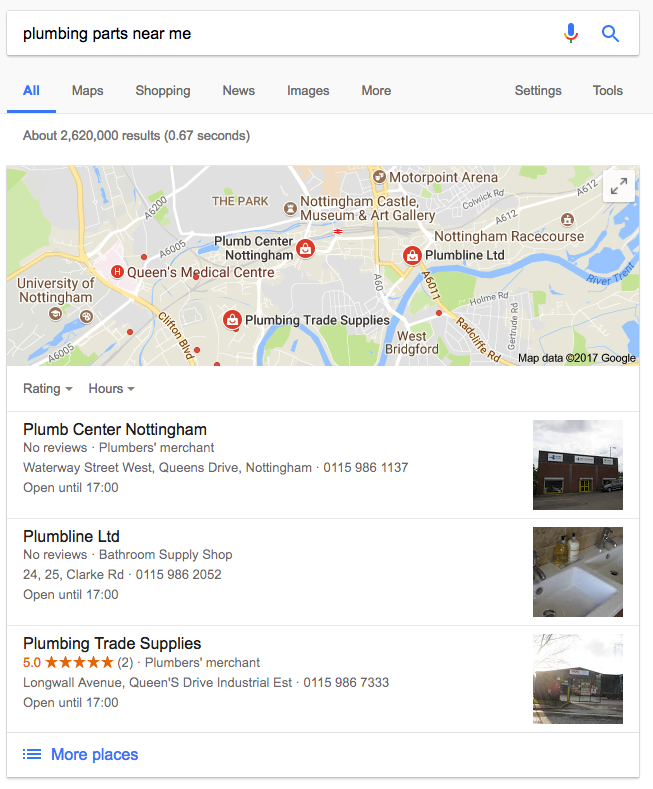 When undertaking a little bit of link building, it’s always a good idea to branch out locally to other businesses within your area. Look for resource boards or directories, they all help to bring the overall local presence of a site up to scratch. This is especially important if you are a brick and mortar business looking to increase local exposure. By building links from relevant local sources, there is a higher chance you’ll be placed higher on Google when users are searching from within that area. It’s also a great chance to network with existing businesses who might be interested in your services. One of the best ways to do this is to start a local business club for those interested in networking on a local perspective. One of the most untapped tools for local marketing is LinkedIn. Especially for B2B businesses looking to get in touch with other local businesses. Try sharing local content, whether that be something that affects the local area, or something about your business, so long as it involves the local nature of the business, there is a good chance it’ll be noticed by other small businesses within your area. Joining groups is another great method for networking from a local perspective. You can put your message in front of an audience that has local ties. Oh, and don’t forget either that you can utilise paid advertising on LinkedIn which opens up a world of local targeting. In fact, if you haven’t used LinkedIn advertising it is one of the most potent ways to generate leads depending on your offering. Geographical targeting isn’t the only option for pinpoint advertising. Through the platform you can target companies based on their size, and even individuals with a specific job title. This opens up an entirely new world of B2B marketing, and the principals of running advertisements are similar to other types of PPC advertising. The advertisement will display a short piece of text, the destination URL, and a headline. Depending on the type of businesses you want to showcase yourselves too, or the product that you are selling, the way you utilise adverts might change. LinkedIn is possibly the best way to network from a B2B perspective, but we would still stick to the more traditional methods for B2C. Taking the leap into local marketing isn’t simply about throwing some money at advertising or time spent with back to basics methods, it’s also about the message that your brand portrays through these touch points. As mentioned before, the intent is such an important thing with local marketing. Everyone will have some form of intent if you capture them in the correct way, but getting your message across involves creating a message that involves their search. 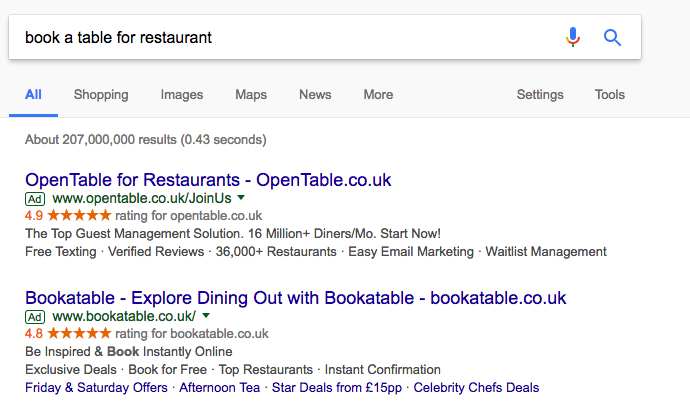 For example, someone who wants to book a table for eating out might search the above, but there is no local intent which is something they could certainly refine slightly. 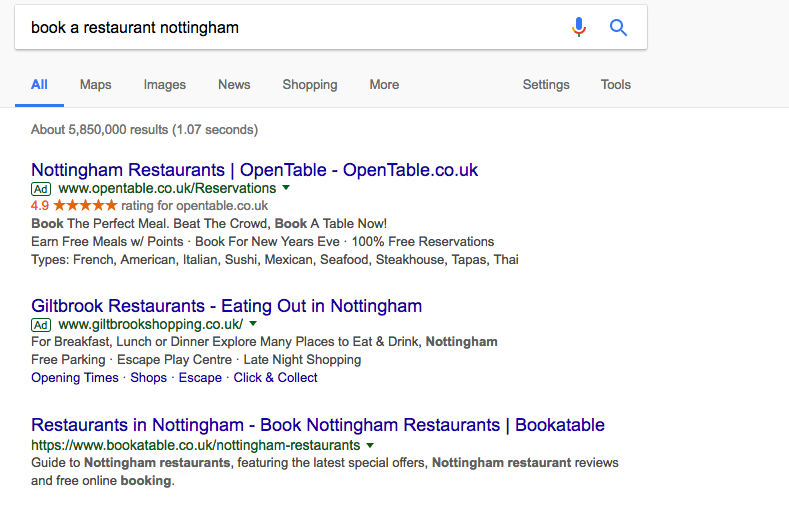 I’m located in Nottingham, therefore the advert should try to woo me towards food in nottingham without me having to type “Nottingham”. Although there are two sides to the argument, in that, the present way they advertise is okay, in reality it could be totally different. Intent is shaping the way that marketers must market their businesses. 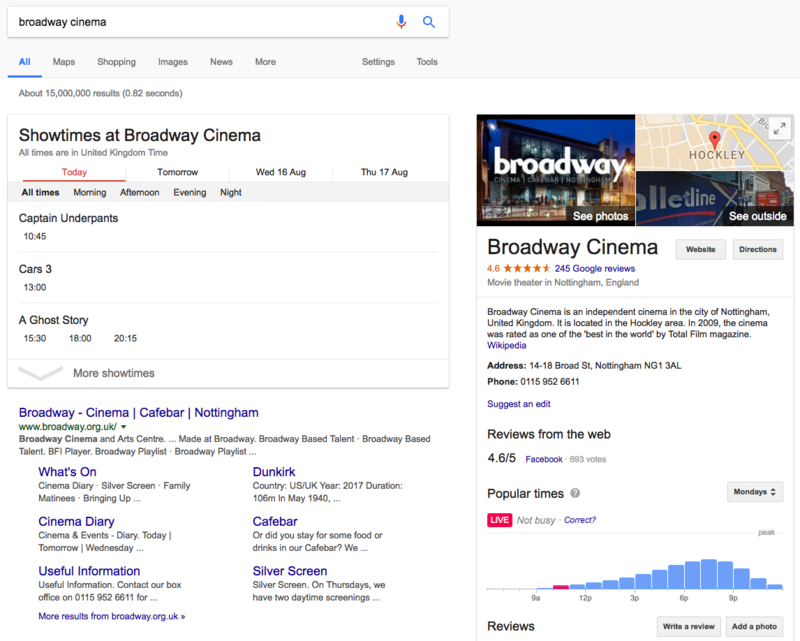 It changes a large amount of variables in the results that are displayed and sometimes you need to take a step back and learn about the semantics of search before embarking on local marketing. So local marketing should be my focus? This article just touches on the possibilities for local marketing, and it doesn’t even highlight some of the cooler stuff that you can do. But regardless of how you are targeting prospective customers on a local level, the key point is to utilise local marketing if you already aren’t. Depending on your business it could be a game changer for your bottom line driving growth and prosperity for the future. Before undertaking any activities I recommend reading deeper into the activities to get a better grasp and understanding for them. Local marketing sorted? Find out how you can supercharge your conversion rate with the power of chat.